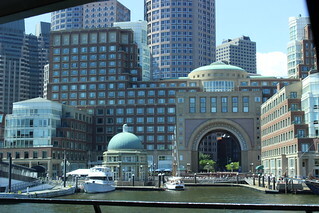 Visiting the Boston Harbor is a must. 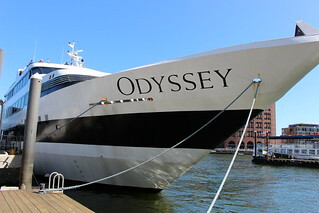 If you want to do classy cruise around the harbor, consider a brunch cruise with the Odyssey. 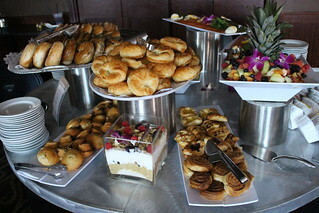 The brunch is a champagne brunch buffet for $62.90 that departs on Sundays. 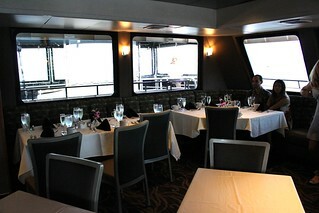 I'm not sure how many dining decks there are, but each one is spacious and comfortable. 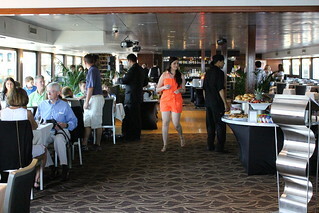 The price includes one glass of champagne and all the food from the buffet. Plenty of space between each white table-cloth settings. 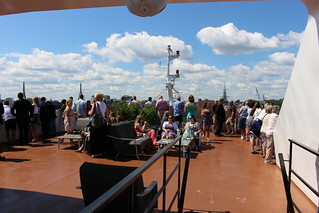 Passengers can start boarding at eating at noon, and the ship leaves the dock at 1pm. They invited us bloggers because they just started a Bloody Mary and Mimosa cart for brunch that's available for an additional charge. Their Bloody Mary was quite good and a little spicy. I had mine with Ketel One but if you want more spice you can try the Absolut Pepper instead. 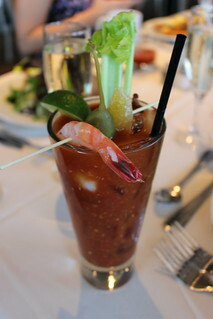 For the garnish, the options include bacon, shrimp, clam, candied ginger, caper, celery, pickled ginger, and more. 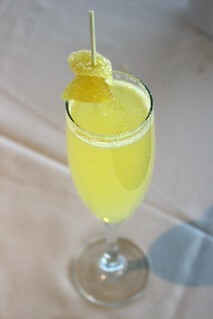 The mimosa is enhanced with St. Germain and candied ginger. OK, back to the food. For the most part, it's basic buffet food. 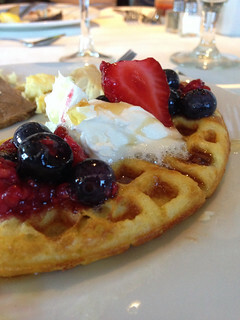 The best part of the breakfast station: freshly made waffles! 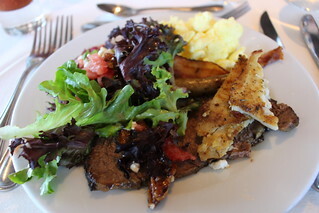 They have breakfast items and eggs and bacon, but there are also more lunch-type options including salad, pasta, fish, etc. 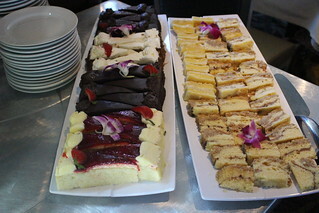 Desserts included chocolate cake, cheesecake, and a chocolate fountain with strawberries for dipping. 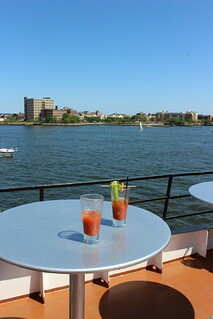 Bloody Marys with this view and this weather. A great way to spend a summer day and we were lucky that it was not too hot! 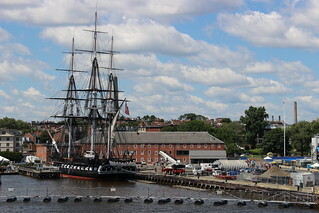 We also passed by the historic USS Constitution along the way. While there was no formal historical "tour", there was a knowledgeable crew member on the top deck who was telling all kinds of fun tidbits about the things we were seeing - from the history to upcoming events like haunted houses for Halloween. 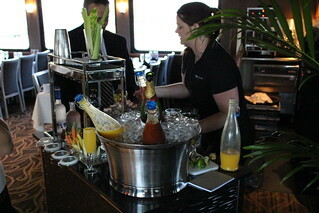 For pricing and schedule of their other cruises, check here. 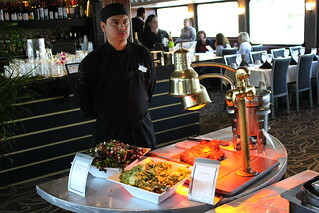 Seeing the lights of Boston during a dinner cruise would be nice, too!